Quentin Long finds that location is key when it comes to a hotel in the Eternal City. If you are visiting Rome, you really want to stay in Rome – in the heart of those narrow cobbled streets, gorging yourself on all that is the Eternal City; that languid sense of time immemorial that comes from a place that has burned bright for more than two millennia. There are countless locations from which to indulge yourself: Piazza Navona and Bernini’s formidable fountains, card-shredding shopping-joy along the Via dei Condotti and the Spanish Steps; the humbling ruins of the Colosseum and the Forum; the winding streets and nooks of the Campo de’ Fiori. From this embarrassment of riches, a humble hotel on the Piazza della Rotonda offers perhaps the best place from which to explore the city. 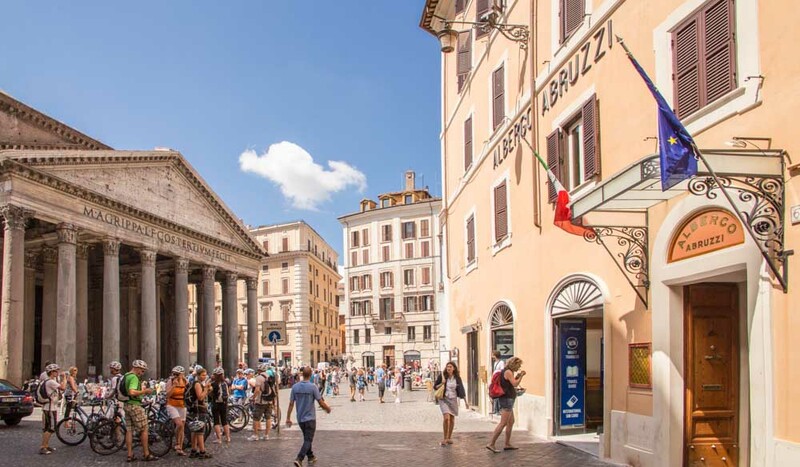 With incredible views of the Pantheon, Hotel Abruzzi has that most sought-after of assets: location. Our Junior Suite exploits this wonderfully – a real room with a view. A mere 30 metres from where we stand, the enormity of the Pantheon is almost palpable. Like Brunelleschi, who studied the Pantheon when developing the engineering solution to construct the dome of Florence’s Duomo, we find ourselves mesmerised by this ancient structure. Modern rooms have perfect views of the Pantheon. The room is in complete contrast to the view: a crisp, mostly white space with flashes of orange and one entire wall emblazoned with a photograph of the Arch of Titus and columns from the Forum. Our suite is surprisingly roomy (for Rome) and the hubbub of the crowds below makes it something of an oasis. An exposed wooden beam breaks up the clean modern space; something that carries through to the small but well-designed bathroom. Most importantly, there’s a decent air conditioning unit, perfect for an afternoon snooze to recharge before a night of carb loading. 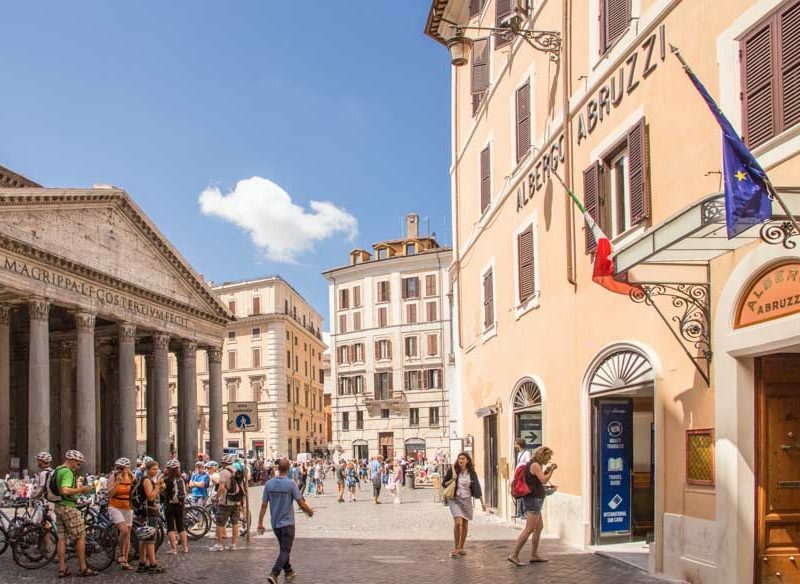 The cafes of the Piazza della Rotonda act as de facto hotel restaurants. The reception desk hands out vouchers for whichever particular cafe is serving the included breakfast. A pre-dinner Campari and blood orange at one of the piazza cafes and people-watching as the sun sets is la dolce vita at its finest. Considering its location, Hotel Abruzzi is surprisingly unpretentious. The check-in area can hardly accommodate more than two people and to access the (world’s slowest) lift you walk up one flight of narrow steps. Don’t fret about your luggage, there is a hotel porter on hand. Hotel Abruzzi does the most essential things brilliantly; its staff are helpful, the rooms are welcoming, the views and location unbeatable. The perfect Rome hotel for those who want to soak up the city, literally from their window. Unbeatable, in the heart of the old city with views of the Pantheon. An easy walk to all the sights. There are very few common areas but they are clean and tidy. The concierge and staff are great at making reservations and giving sound local advice. A modern fit-out with ample space by Rome standards. Good design and a thoughtful aesthetic. The cafes that provide breakfast have a typical Roman offering but there is no on-site restaurant. A Junior Suite during the height of summer averaged $483 per night including taxes and charges.